A lot of people start a business for a lot of distinct reasons. Some want the feeling of being a boss; some want to be autonomous, some needs more time with their family and some just want to solve problems profitably. For men of God, it is essential to have another work apart from following God’s calling. It is true the Lord has provided for our upkeep as seen in some holy books but it is a very respectable thing to do to use your God-given skills to start an organization where you can help people by employing them, making profit and using part or all of the gain to better the lives of your congregation. When working out how to start a for-profit ministry, identifying a need to satisfy is one of the most challenging. You may have a plethora of skills you will find difficult which one to tap from. You may also identify a lot of needs you can find a solution to profitably, but you can’t do all. That’s why you have to do your homework well to ensure you follow the right way. Ensure all profitable business you want to establish is pious so as not deviate from the long-term objective, which is to help the ministry. Only clean money is accepted by the lord. All startup business needs a very generous amount to get going. 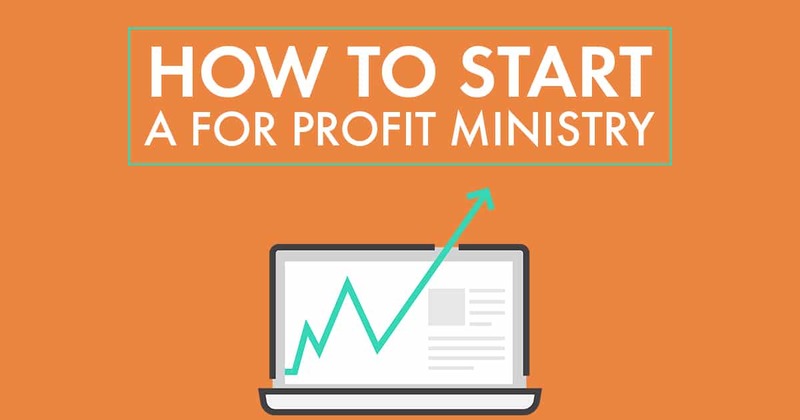 You will need capital to get some equipment that will aid you in your ministry like electronic equipment like printers, computers, supplies and others like setting up websites, advertising, office, registration of the company, etc. you can source for capital through angel investors, crowdfunding or personal savings. Others include grants, business loans, family, and friends or peer funding. However, it is essential to have a reasonable and prudent sense of spending in order not to jeopardize the business even before starting at all as a result of extravagant expenditure. Knowing when to spend and what to spend on will do your long-term objective of helping the ministry a world of good. We have different kind of structures in business. We have the sole proprietorship (which is the simplest to start up), partnership, Joint company, etc. The sole proprietorship is the best for a single person who is just starting up, and putting into consideration the long-term objective of starting up this business, it will be more flexible to make use of the profit alone than sharing it with people who may not share the same mission as yours. It is not an easy decision to leave your steady morning to evening work to focus on your business and try to grow it to a profitable level, in addition to the objective of using part or all of the profit to better the lives of your proposed or already existing ministry. Apart from taking a toll on your existing income structure and savings, it takes a lot of mental and physical energy to get it up and running. However, the ecstasy of being your boss and the inspiration to be a problem solver, while bettering the lives of your ministry will always keep you going. The location of a new business is crucial to the profitability of it. However, the kind of business you are starting and the legislation in your area, the value of your capital and the type of life you live will be a significant factor in your deciding your business location. Starting a new business can be very delicate and challenging, it is much more than selling and buying. You will be available for a lot of things ranging from your monetary aspects, protecting your assets, ensuring your business operates around the ambit of the law, prompt payment of taxes and making your employees stay productive and happy. If you don’t deviate from the purpose of setting up this for profit ministry and have complete knowledge on how to manage the risks, success will be hovering all around you. The best way to build, grow and help your for profit ministry is by having your business where you can always look towards to assist and empower a lot of people to be independent, forward-thinking and pious in the discharge of the duties of the lord.